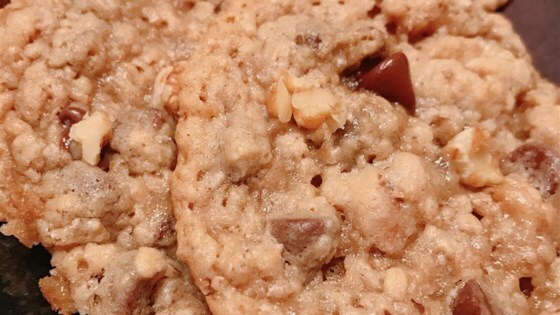 "A great variation on standard chocolate chip cookies. Makes 50 large or 100 small cookies." In a large bowl, cream the margarine, butter and both sugars until light and fluffy. Add the eggs, milk and vanilla and beat until well blended. Sift the flour, baking powder, baking soda and salt together and add to the butter mixture. Stir just until blended. Stir in the oats until well blended. Fold in the chocolate and walnuts. Cover and refrigerate the dough for at least 1 hour. Take a teaspoonful (for small cookies) or a tablespoonful (for large cookies) of dough and shape the dough into balls. Flatten slightly into rounded disks. Place 2 inches apart on the cookie sheets and bake until the edges are slightly browned, about 10 minutes. Remove from the oven and let cool on the sheets for about 10 minutes. Remove to wire racks to cool completely. very nice cookie, excellent cruch.